U.S. President Donald Trump is going all-in for a South Carolina governor in a tense runoff election, betting that his last-minute appearance will help make the difference. Trump was campaigning Monday for Republican Gov. 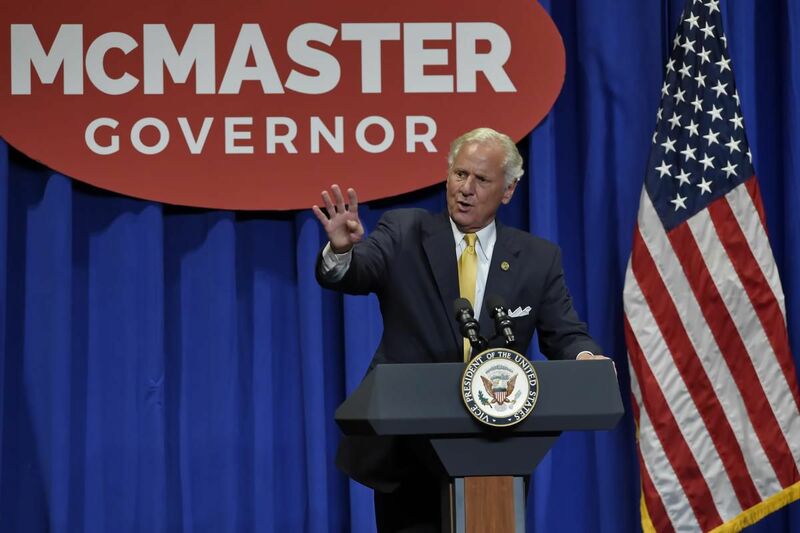 Henry McMaster in West Columbia, S.C., returning the favour after McMaster provided Trump with an early endorsement in his presidential campaign. Monday’s rally carries some political risk for the president if McMaster gets tripped up in Tuesday’s primary. South Carolina Republican voters are choosing between McMaster and Greenville businessman John Warren in a runoff for the GOP gubernatorial nomination. McMaster received the most votes in a June 12 primary but fell short of the 50 per cent needed to win the nomination outright, giving Warren an opening. Trump, predicting a “red wave” in the fall mid-term elections, has been holding rallies and campaign events on behalf of several Republicans in recent weeks. He staged one of his signature rallies last week to tout congressional candidates in Minnesota and raised money in Las Vegas on Saturday for Nevada Sen. Dean Heller, one of the most endangered Republican senators on the 2018 ballot. Trump will travel to Fargo, N.D., on Wednesday for a rally aimed at bolstering Rep. Kevin Cramer, who is trying to unseat Democratic Sen. Heidi Heitkamp in North Dakota. The trip will also include a campaign fundraising stop in Milwaukee on Thursday. Wading into Republican primaries has proved risky for Trump. He backed Alabama Sen. Luther Strange over Roy Moore in the state’s Republican primary last year but watched as Moore prevailed despite multiple allegations of sexual misconduct against the former judge. Moore was defeated by Democrat Doug Jones in the special election. But Trump has been emboldened of late with a flurry of endorsements aimed at Republican loyalists. He successfully intervened in the eleventh hour in a heated South Carolina congressional primary, urging voters to reject Republican Rep. Mark Sanford, a former governor and Trump critic. Trump also warned Republican voters in West Virginia to steer clear of businessman Don Blankenship, arguing he couldn’t beat vulnerable Democratic Sen. Joe Manchin. Republicans nominated state attorney general Patrick Morrisey in what expects to be a top Senate showdown. McMaster, a former lieutenant governor, became the nation’s first statewide elected official to endorse Trump in January 2016. Trump won a convincing victory in the state’s presidential primary and won the state in November. When Trump selected then-South Carolina Gov. Nikki Haley to serve as his United Nations ambassador, it allowed McMaster to become governor. McMaster has aligned himself with Trump, defending the president’s handling of immigration and praising Trump’s recent summit with North Korean leader Kim Jong Un. McMaster has tried to make Trump a litmus test, noting that his opponent supported Sen. Ted Cruz of Texas in the 2016 presidential primary. “Had my opponent had his way, we wouldn’t have had President Trump as president,” McMaster said Sunday on Fox News. McMaster himself initially endorsed South Carolina Sen. Lindsey Graham’s short-lived campaign. Warren, who served in the Marines and founded a mortgage lending business, has tried to claim the role of political outsider in a state where voters were drawn to Trump’s populist appeal. The winner will face Democratic state Rep. James Smith in fall election. The Republican-leaning state hasn’t elected a Democratic governor since Jim Hodges in 1998.